Rising star vibraphonist Tyler Blanton is garnering notice in the New York Jazz scene and beyond. Over the past five years, his work has received reviews by numerous major publications including Downbeat, Jazztimes, Village Voice, and The New York Times. His second album as a leader, Gotham, was released in 2014 and features a powerhouse working quartet consisting of drummer Nate Wood, bassist Matt Clohesy and Saxophonist Donny McCaslin. 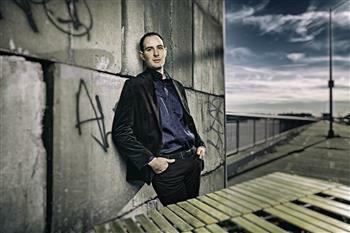 In a recent review by Dave Wayne of All About Jazz, Gotham was described as “Tough, gritty, fast- paced…nothing short of remarkable.” A native of California, Blanton moved to New York City in 2007 where he has since shared the stage with the likes of Ari Hoenig, Joel Frahm, Matt Wilson, and many others. In demand as an educator and bandleader. he has lead tours and masterclasses on vibraphone and improvisation techniques throughout the US, Europe, and Asia.